Written Russian beauties in national costumes – heroines of portraits of Konstantin Makovsky from the 1880s. The most popular in those years, the Russian artist became interested in studying women’s costumes of past eras. He was interested in Russia XV – XVII centuries. In a somewhat idealistic representation, he created a numerous series of canvases with Russian haws. The work “Boyaris at the Window” was written approximately in the 1890s. We see the genre scene of life of the well-off boyar’s daughter. The girl is dressed in a traditional costume: a long red shirt, over which a long-field dress is worn, an embroidered collar wrapped around the neck. On the head of the model is a beautiful kokoshnik. The girl’s face is healthy, ruddy, expresses calm and dignity. The boy is dressed on a wooden bench in a Russian wooden board hut. Before it stands a spinning machine. The young lady was distracted from the weaving class, directing her dreamy look through the window. Makovsky wrote out in detail all the details of the interior decoration of the house. An amazing carved pattern is seen along the plank wall, and the daylight falling from the window naturally reflects on its glossy curves. The top corner is occupied by an icon and a burning candle. All furniture and spinning wheel are made with amazing skill by hand craftsmen. 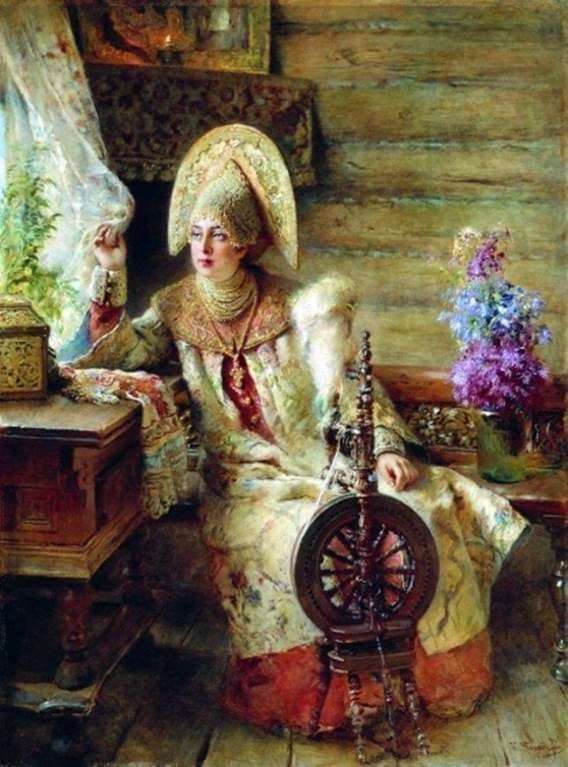 Makovsky chose the style of romanticism for a series of Russian beauties. Their poetic beautiful faces are black-browed, with thick eyelashes, ruddy and blooming with youth. The costume of the girl looks festive and luxurious. Floral motifs in robes, pearls, glitter of gold threads harmoniously frame the person who thinks. These are exactly what the Russian artist of women of a bygone age wanted to see. Although most of the paintings by Makovsky were sold at high prices abroad, “The Boy’s window” on a happy occasion came to the Nizhny Novgorod Art Museum.